DESCRIPTION: Slow-crawling, round-bodied pests which have two sets of legs on each body segment. 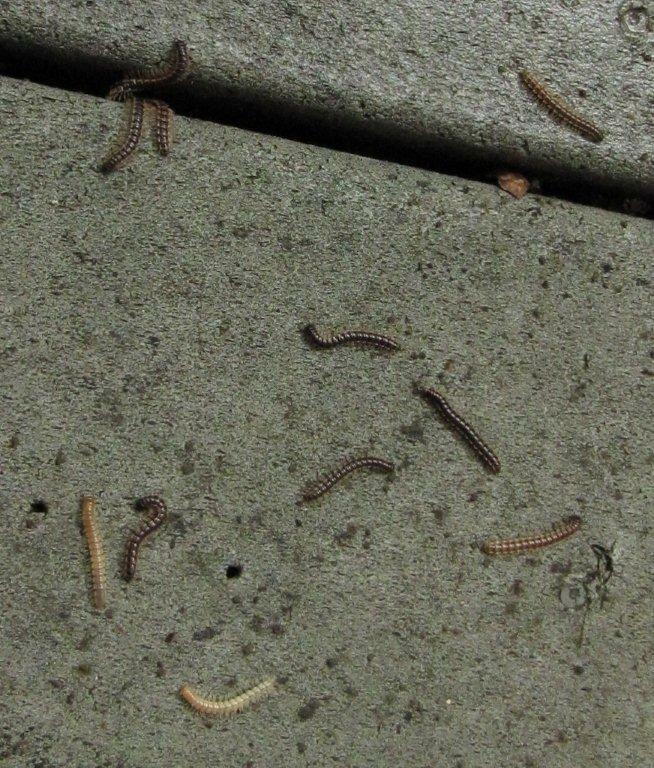 Millipedes develop best in damp and dark locations with abundant organic matter (food). They often curl up into a tight "C" shape, like a watch spring, and remain motionless when touched. The body is long and cylindrical. IDENTIFICATION: Wormlike soil dwellers with two pair of legs per segment. When being handled, will leave an odor on your hands. Slower-moving than centipedes, body is rounded instead of flat like the centipede's. Short antennae. Many species have an offensive odor. 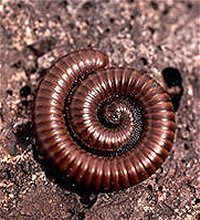 HABITAT: Millipedes have caused some problems in the summer and fall. Areas around houses that provide these conditions include piles of grass clippings, a wooded lot close to the house, excessive mulch around the house, and similar locations. Protected moist areas, under logs and stones, and in greenhouses. LIFE CYCLE: They lay eggs in the spring and populations build up during the summer. Under good conditions (adequate food and habitat), populations can become very large. Then changes in the habitat (excessive moisture, lack of food, too little moisture) cause the population to disperse. TYPE OF DAMAGE: May infest a basement and other parts of the house in the fall. BIOLOGY AND LIFE CYCLE: Not poisonous but can cause allergic reactions. Fluid can damage eyes. Lay eggs in the soil. Nymphs are shorter and have fewer segments. Incomplete metamorphosis. FEEDING HABITS: Feed mostly on decaying organic matter. Will sometimes damage seedlings, especially in damp soils. 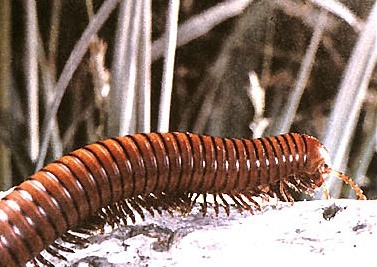 Some millipedes are predators and eat small insects. Some millipedes will eat plant roots, but for the most part they are beneficial breaking down organic matter. ECONOMIC IMPORTANCE: Beneficial in breaking down organic matter, but will eat fruit that rests on the ground--such as strawberries and tomatoes. NATURAL CONTROL: Mulch bare soil to keep low-growing fruit off the soil. Maintain biodiversity. ORGANIC CONTROL: Dry soil out with wood ashes or diatomaceous earth. Drench soil with citrus tea if millipedes become a problem. Millipedes and centipedes can be controlled by vacuuming, but neither do much, if any, damage indoors and they are beneficial outdoors. INSIGHT: Millipedes are sometimes mistaken for the pest wireworms.